Jori gaat naar Noorwegen! : Midtårsoppholdet region 1! We talked and talked and talked and played games and sung and ate some food that is traditional for a hyttetur (a hyttetur is a trip to the cabin, in the mountains, to enjoy the beautiful nature. In summer you walk, in winter you ski :) ) The food was hot dogs on friday night, something that Norwegians seem to believe is typically Norwegian, but I beg to differ. 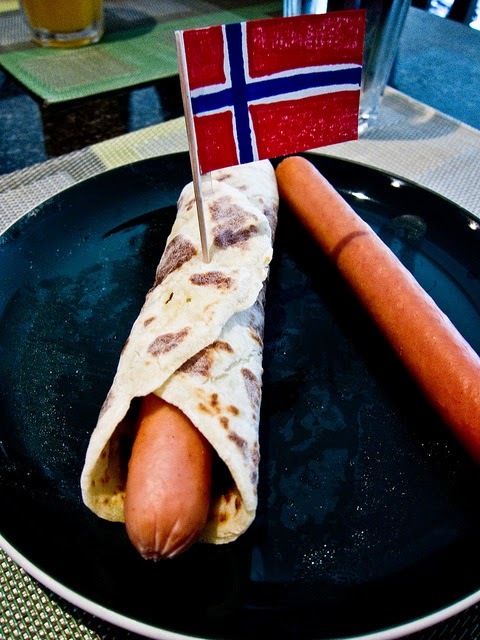 However, when you eat the sausage with lompe instead of bread, I can't really deny the norwegian feeling you get. Skiing was fun. We had the choice between a long tur, a short tur and just playing around on skies. I went for the short tur, because I still don't really feel very confident on those thin sticks. I'm happy I didn't go for the long one anyway, because the trip that was supposed to be around 8 km long, turned out to be 16 km, and I know for sure that I wouldn't have made that back alive. Kudo's to those who did, by the way. You guys are my heroes! Here are some pictures of the snow and us in it! My loyal friends. Holding me up in the snow! Just a friendly hump of snow taking a peek into our bedroom. This? Oh this is just the view from our bedroom! a snowy mountain, not that far away! Roomies getting ready to go skiing! Ski-break! Time to put the ski's aside for a couple of minutes! But I got it back eventually! Proof that I was actually on skies. ... you take obligatory selfies again! "U hebt uw bestemming bereikt"
Jessica and I made it to the end! Apart from the skiing, we took a bunch of pictures and also played a game, which included playing musical chairs, two short quizzes and lots of creative assignments. Erin being rude to dead animals! Most exciting musical chairs-finale ever! A beautiful Italian in an even more beautiful Marius-genser! White girl becomes one of the Latinas! And after all of those crazy fun times, sadly, the camp was over too soon! Only two days did we enjoy each others company, not nearly long enough! But we'll see each other before we know it! I love you guys so much! REGION ONE FOR EVER! hugs and kisses from the only belgian around here!